Version 3.19 for iOS is live on the App Store since yesterday (Tuesday) evening. We will update the iPad HD app with the same next week. No update planned for our Power Contacts app this month. You submit one or more cards for manual transcriptions (from the iOS app or from the Web Sync web interface). You can quit the mobile app and go about your business. As soon as transcription results are available you will get a little notice on the top part of your iPhone screen. The camera overlay when taking photos of business cards failed to cover a portion of the right side of the screen, now fixed. The option to directly snap the next business card photo was crashing – now fixed. Upgrading from Lite to Premium means installing a new app and left users confused about what happened to cards held in the Premium app. We have now added clear instructions pointing to our FAQ page. Version 3.18 for iOS / Version 1.03 for the iPad are live on the App Store since Sunday, January 13. The major news in this update is a major upgrade of the OCR component – we’d love to hear from the experienced users among you if you were able to notice improvements in the OCR accuracy. We have upgraded both the iOS and iPad apps with a new version of the OCR engine. Its is about 10% faster and we hope significantly more accurate. Please let us know! The Lite version of the app didn’t have the proper user interface to take advantage of the taller iPhone 5 screen – fixed now. Just like Salesforce and SugarCRM, we are delighted to announce a new export ability to Oracle Fusion CRM! Please help us test it so we can iterate and fix issues – if any – quickly. We’ve added the ability to assign contacts and leads to campaigns as well as to accounts. The sort button in the iPad was crashing, now fixed. The Evernote export had stopped working following a change on the Evernote side – now fixed. If your business involves processing information on business cards or email signatures, you can augment ScanBizCards to add a new custom export option directly to your application! Please email for details. By popular demand: you may now assign Salesforce Contacts created by the app to any account defined in your Salesforce backend. For those of you using Power Contacts (see App Store), an update with a fix to the Evernote export has been posted as well. 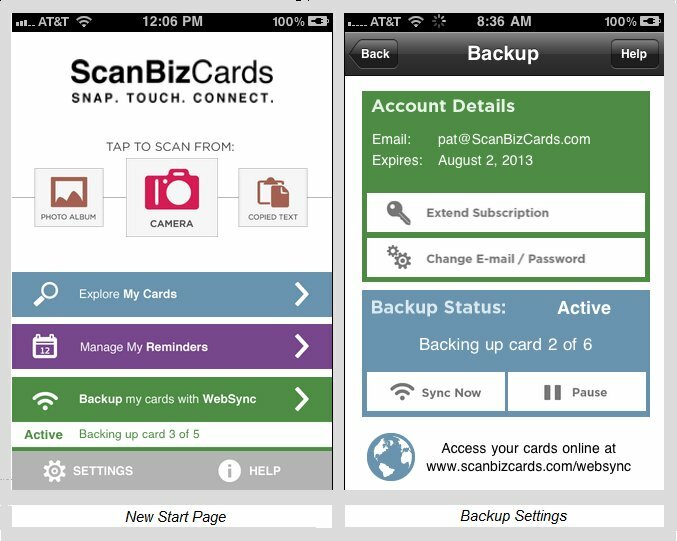 A little over a month ago Apple approved the very first version of ScanBizCards HD, a native iPad version of the app! We started working on this app not long after Apple released the iPad 3 and took us about 5 months to complete. I’ll be honest: I was totally amazed how much more content we are able to show when utilizing the full 9.7-inch screen. And that’s really the purpose of ScanBizCards HD – showing you everything that matters on the same screen. It goes without saying that ScanBizCards HD has all the features of the iPhone version of ScanBizCards, it’s all about esthetics, usability and improved workflow … check the screenshots of the app on its App Store Page! If you are running ScanBizCards on another iOS device, Android or Windows Phone Web Sync will also enable you to keep them all in sync with the same cards. This means you could use your iPhone to take photos of cards and scan them but then pick up the iPad to edit scan results and manage the cards. For those of you who never tried the Web Sync service please check this demo Web Sync account. Note: please remember to logout from this demo account otherwise you won’t be able to login to your own Web Sync account. iPad 1 & iPad 2 Note: please remember that prior to the iPad 3 (“New iPad”) the iPad 1 & 2 models don’t have a camera good enough for scanning business card photos. If you have these older models please use your phone for taking photos – then by all means do all the rest on the iPad. Batch Export to Salesforce, SugarCRM and Jigsaw All these batch exports fail to dismiss the view showing the export results. To return to normalcy, please toggle the view to mosaic view and back to list view, using the button on the top / middle of the toolbar. Editing Cards The keyboard sometimes hides the field you are trying to edit. Please scroll the view to expose the text field above the keyboard. Other Issues Remember this is Version 1.0! Let us know ASAP of any issues at info@scanbizcards.com, we plan to update the app quickly to address them. UPDATE: Version 1.01 has been out for a couple of weeks since we originally wrote this, and version 1.02 was just sent to Apple for approval! Version 3.09 was posted last night (Thursday Oct 13)! Survey! Share your opinion about ScanBizCards and get a chance to earn a $300 Apple gift certificate. Reminder: Jigsaw export available for Beta testing. iOS5 notice: before we go into details a quick heads up – we are being told that our feature to create a contact from the clipboard is not working on iOS5. We are looking into it and will fix this in an update soon. This one is exciting. Say you just scanned a card and got disappointing results. Yes, I know what you are thinking – never happens with ScanBizCards! We wish, and we are working on it, meanwhile, yes, it does happen (just don’t tell anyone). We are now launching a brand new service which will let you simply touch a button to request that someone in our transcription team go over that card and manually fix what needs to be fixed! Cards pending review are marked in red then as soon as results are in you will see a message in the app and transcribed cards will turn green. All pending and transcribed cards will also appear in a special folder. Because this is brand new we don’t quite know yet how quickly we will be able to review cards but we are hoping to keep it under 30 minutes, and pricing that service is also not set in stone until we measure how long it takes to rectify cards. The idea is really to offer the best of both worlds: instant OCR results + option to go manual if we missed too many items – and in any case have all extended features of the app available regardless. Note: at this time it requires an active Web Sync subscription. Please email info@scanbizcards.com if you’d like to join the private Beta of this service. Long overdue. Until now we showed scan results in the order found on the card (top down and left to right). This is really helpful to the ScanBizCards team, to easily associate a text result with a pattern on the card, less useful to our customers who care about the person’s name, title, company etc regardless of where that information was found on the card! Apparently we realized only now that there are more customers of the app than ScanBizCards team members so with this update all cards will display scan results in the same consistent order: name, job title(s), company, phone(s), email(s), URL(s) and address(es). Note that online (Web Sync) we always displayed contact info in that order so now the app is doing the same. We added a new button right on the main page at the bottom to share a recommendation for ScanBizCards with your Facebook, Twitter and LinkedIn networks or just via email. It offers your friend a link to install the Lite app with another link which then upgrades the Lite app to premium features for 2 weeks. No less importantly, we keep track of these invites and each time one of your friends – even one year later – decides to buy the app, we PayPal you $1! You can be on your way to untold riches, don’t wait :-). Note: you can track the status of invites and conversions at http://www.scanbizcards.com/tellafriend.php?email=your-email-address (where your-email-address is the email address you provided when sharing from the app). That page also includes a checkbox to request 1 month free Web Sync instead of the $1 PayPal payment each time. Daylite CRM recently added an option to import from ScanBizCards on their new contact page. This update adds an option to initiate this exporting into Daylite from within ScanBizCards. You’ll find the Daylite option right next to the Salesforce export on the export menu. Note: this means you can now export to Daylite any previously scanned card or contacts you capture from text copied to the clipboard. This update fixes several issues with Saleforce accounts where certain standard fields are excluded from the Lead Layout (e.g. Fax and Mobile). The app now download the full list of both standard and custom fields and lets you control which fields you wants to prompted for. We also added a new setting to export to Salesforce as new contacts (rather than new leads). ScanBizCards added a feature to export to Jigsaw i V3.08. Jigsaw is a service that enables you to get up to date direct contact info for a great many professional contacts in the Jigsaw database (27m contacts). The way it works is that you earn points for contributing a contact which you can then use to retrieve another contact. I personally use the service and love it. Note: Jigsaw accepts contacts only in some countries and the app will tell you when you try to export a contact in a country where Jigsaw doesn’t operate. Note also that currently the app doesn’t allow getting credit for updating contacts already in the Jigsaw database, for this you would have to do it on the Jigsaw web site. To be addressed soon. Sign-up at www.jigsaw.com. By all means do tell us what you think about this feature! Not that new actually, it was released in April. This is just a little app to select a subset of your address book in a flexible way, select which property you care about, their order and how you want to call them – then export into an Excel CSV file. Useful to export contacts into other apps such as CRM apps or email marketing, to share contacts with others or simply to make periodicals backups of your address book. Try it here . We swear it distracted us from ScanBizCards only for a few days! Tip #1: finding light in dark places. Ever wanted to scan a card in a dimly lit place? Using the flash is not an option as it creates overexposure where it hits the card but there is a solution! Borrow someone’s cell phone or tablet , run an app on it with a light background (such as the iPhone mail app). Hold that other phone face down to shine light on the card and voila, should be a great scan! You can use the same trick with your own laptop, placing the card on the keyboard and half closing the lid to shine light on the card. Tip #2: starting with this version we start processing cards as soon as you take a photo. This means that you should consider cropping cards before scanning – if nothing else for aesthetic reasons – because we are putting the time you spend doing that to good use! You know what to do! Your continued support helps us break the record of being the “idiots” who spent the longest time enhancing a single iPhone app :). Apple saves your last review so it only takes a minute to update a previous review for the current version: tap Help on the start page then “Rate This Version”. 6. Android update: it’s the first time we include Android users in this monthly mailing. The Android app is subject to a different release cycle so I will just recap recent changes in the last few Android updates. – custom fields: custom fields are now imported into the app and you are prompted to enter values for custom required fields with no defaults (previously this would fail the export). You can also set defaults for any custom field or require to be prompted for certain fields. And speaking of Salesforce, Patrick is at Dreamforce in San Francisco this week: if you are there too, say hello! ScanBizCards now includes a feature to export to Jigsaw! Jigsaw is a service that enables you to get up to date direct contact info for a great many professional contacts in the Jigsaw database (27m contacts). The way it works is that you earn points for contributing a contact which you can then use to retrieve another contact. I personally use the service and love it. Note: Jigsaw accepts contacts only in some countries and the app will tell you when you try to export a contact in a country where Jigsaw doesn’t operate. Note also that currently the app doesn’t allow getting credit for updating contacts already in the Jigsaw database, for this you would have to do it on the Jigsaw web site. To be addressed soon. Sign-up at www.jigsaw.com. – web based OCR: you have the option to crop and OCR cards online. This could be cards you snapped on the phone but also cards captured with a flatbed scanner or another camera. Web Sync is now at a point where you can use it as a standalone application to scan cards without having a mobile device! In coming weeks we will provide more tutorials and add an official “Desktop” section to the web site. One feature we are still working on is the ability to process scanner captures of multiple cards more efficiently by detecting where cards are located in the image. We swear it distracted us from ScanBizCards only for a few days! Web Sync: added to the Android app a few weeks ago, recently fixed some issues & added status messages. Double-sided cards support: added a few weeks ago (also available online for web sync users). LinkedIn: long overdue! You can now send a LinkedIn invite to new contacts in one touch. Salesforce: the current Salesforce support in the Android app is at the level of the iPhone previous version: works only for Enterprise accounts, no custom fields support and no batch export . Yuval Kohavi and Steven Lustig on our Android team are hard at work to add these very soon. You probably already realized that cropping makes for nicer card images. But with this update cropping can really help with accuracy a lot when you are cropping away a large chunk of the image. This is because when that happens we assume text size is small and so we treat the image differently. If the first tip applies to you often maybe it means you are not getting close enough to the text! Remember that the relevant text on the card should ideally fill the entire viewport, to get larger text. Your continued support helps us break the record of being the “idiots” who spent the longest time enhancing a single iPhone app :-). Apple saves your last review so it only takes a minute to update a previous review for the current version. You know what to do! Please tap Help on the start page of the app, then “Rate This Version”. Remember to use the Refer A Friend button on the Help page! Your friends get a free 2-week trial of the premium features and you get 1 month of Web Sync or $1 if they decide they like the app enough to buy it. We would also be delighted to extend the same limited time premium trial to all attendees of conferences! If you or someone you know organizes conferences, talk to us! ScanBizCards V3.04 has just been approved by Apple! Quickly this time too, in just two days. We spent 2.5 months on that update so there are plenty of improvement even if many are to the unseen hand of accuracy. Web-based scanning: we just added to the web the ability to crop/rotate & scan in 22 languages – which actually makes Web Sync a complete stand-alone desktop application. This means you can upload card images directly from your desktop, crop, rotate and scan them without involving your iPhone at all. In fact, the most accurate scanning is via a flatbed scanner at highest DPI, several cards at a time then upload the image multiple time and crop each time around a different card. To find the web-based scanning, click a card and look for a link to “Open the Image Editor” on the bottom left. Note that the web-based OCR is actually always ahead of the iPhone app, because updates there are in real-time – for example, this morning it was 2.5 months ahead of the iPhone app until it got updated … Coming soon: a function to print all these cards into a nice set of hard copies. Salesforce.com: exporting directly to Salesforce.com is now possible. Contacts are created within Salesforce as a new lead so you’ll find them in the “New Leads” section of your Salesforce.com account. Right now exporting is one card at a time, at the end of scanning or by opening an existing card and touching the actions menu -> Export -> Saleforce. Coming soon: option to batch export cards to Salesforce. Scanning Accuracy: the never-ending quest. This update has an incremental improvement in the image processing but a long list of specific fixes (for example correcting false ‘1’ to the intended ‘7’, open o’s into c, and many more). I hope you notice the improvements (let me know). We are not done (and never will be?). Coming soon: Michael Kolomenkin is almost done with a major rewrite of the image processing. Android Update: we are almost ready to make Web Sync available for Android devices but if you own an Android device and would like to see your cards there too you can Beta test this now – email us at info@scanbizcards.com for details. ScanBizCards includes a process to automatically detect text orientation. That’s great when importing photos taken outside of the app in all kinds of orientation, but if you take photos within the app and follow the on-screen guidance, you don’t really need that stage. To save the 1 or 2 seconds of orientation detection please disable it in the app’s settings. Important: if you do that, remember to always rotate the card manually before scanning if necessary – one example where that’s going to be needed is when you take a photo of a vertical business card: you’ll get largest text by snapping a photo of it oriented sideways (to fill the screen), ignoring our guidance, but then remember to rotate it back up. Having trouble syncing contacts into Outlook? Many users of the app are asking about this. The way our app works is by adding new contacts into the iPhone address book and from there we expect these contacts to make their way into your Outlook address book by way of whatever syncing mechanism you have in place, such as iTunes and a USB cable. The reality is that more and more iPhone users are “cutting the cord” and not syncing often or not at all. There is a simple solution: just use Web Sync then from any browser, click a card then Export as VCard, download and open. This will invoke Outlook or the Mac Address Book on your desktop and then you can just save that contact there. Since we are all obsessed with scanning contacts from business cards, we thought you might enjoy a mini-app to take some/all of your contacts for exporting to a CSV (comma-separated) file. Reasons that come to mind include simply having the security of an extra backup, sharing some contacts with a colleague or exporting contacts into a CRM application. One little extra feature: the app lets you sort your contacts by creation date – who can remember the last 5 contacts entered at a conference in a sea of thousands of exiting contacts?! Version 3.02 was released to the App Store World-wide tonight. It includes a long awaited overhaul of the application’s main page, a fix for a memory leak we have had forever (causing the app to crash when scanning many cards in a row) and special handling to enable saving contacts directly into Exchange and MobileMe accounts. Last but not least: we are live on the Android Market!!! No more Wrigley-green background with cute icons, we now have a more professional looking main application screen as well as a new Web Sync settings screen, courtesy of Jonathan Moldofsky from JGrant Design. We also took the opportunity to address one common usability issue: our app’s complexity and options make it sometimes hard to figure out what’s tyhe next step. For example, we don’t force the user to save a card to the address book – because oftentimes the user indeed doesn’t want to do that – but then it may confuse some users that at the end of scanning nothing is added to the address book unless you press “Add To Address Book”. Well, now we paint that button blue, to highlight it as a recommended next step – and do a similar coloring on other screens. We call is “Episode I” because we are not done redesigning the UI, there is more to come. To most users a memory leak means simply a crash after using the app for a while. This has been a problem within the app for many month, causing for example to crash when scanning 16 cards consecutively on an iPhone 3GS. No more – we can now scan in excess of 75 cards in a same session on the iPhone 3GS and much more on the iPhone 4. Users of Exchange and MobileMe often ran into trouble getting new contacts saved into the iPhone address book to sync with their external mail account. No more: we now list all foreign address books and all groups under them in the ScanBizCards group assignment function. I believe we are the only scanning app giving that level of control for groups. ScanBizCards is LIVE on the Android Market! As of last Sunday, February 21, it’s official: ScanBizCards is now running on thousands of Android phones. It wasn’t easy and it took over 5 months but our Android, C++ and Java expert Yuval Kohavi did it. If you have an Android device, give it a try, here is a link to the app on the Android Market. It still lacks many of the extended features of the iPhone version but we’ll try to close the gap soon. A very nice comprehensive review of ScanBizCards was posted by Crazy Mike on Friday, watch it below! A fresh review by Derek Walter posted tonight on a new app review site TheAppPlanet.com, showing the new V3.02 UI. ScanBizCards has been chosen as a finalist in the APPY Awards 2011 (check the Productivity category)! Version 3.01 was released to the App Store World-wide last night. The main purpose of this update is another round of improvements to the image processing stage of the scanning process but we also added a number of usability improvements. Image processing produces the black and white image you see halfway through the scanning process. Its correctness in detecting letters and isolating them from the background is crucial to the OCR process. This update helps render blurry text a little better and eliminates more non-text noise. We are continuing to work on this component in the capable hands of our resident image processing PhD Michael Kolomenkin. At the request of Laura Walton we added a new virtual folder shown before all others entitled “All Cards”. This addresses the inability of browsing through all cards regardless of which folder they belong to. Within that folder we added a new button to each card displaying which folder the card belongs to: touching that button opens the folder in question. Until this update when searching cards and opening one, the “Back” button from card view was taking you back to the containing folder instead of the more sensible set of search results. This is now fixed by adding the folders buttons to search results, thus eliminating the need to return from card view to search results. Version 3.0 introduced several bugs causing crashes with some cards. This is the result of the excellent work done in recent work by our C++ guru Yuval Kohavi to support international languages and Android phones – but which had the side effects of turning dormant yet harmless pre-existing bugs into crashes … all fixed now, we hope. The way editing card data on the web works, changes are automatically saved every 2 seconds. Unfortunately, a quick user leaving the edit page too quickly after making edits may lose these edits as reported by some of you! We are addressing this issue this week, possibly later today. Meanwhile we have fixed this situation to not erase the previous content of the text field and instead only discarding the last change. Say Hello To Your Cards Online! It’s almost ready – want to help us test it? Shoot yuval.kohavi@scanbizcards.com an email, it’s a very easy installation process. Shows ScanBizCards used on the iPad to scan business cards imported from a camera or iPhone, browse through contacts in 2D / 3D views, edit cards – even place a phone call using the ScanBizCards Skype integration.